I have just arrived home from the Special Session of General Conference in St. Louis, addressing issues of ordination and marriage of those in the gay community. By a margin of 53% to 47% the conference approved the Traditional Plan, which maintains our current stance regarding marriage and ordination, but also calls for more punitive measures toward those who violate these prohibitions. We will await a ruling from the Judicial Council regarding the constitutionality of this plan, but, either way, these bans remain in place. In our congregation, we know everyone is not of one mind on the complicated issues of human sexuality. What I have learned on a number of matters is that faithful Christians can read the same Bible and draw different conclusions. The denomination remains divided on this issue, and that doesn’t go away with this vote of General Conference. One thing is clear to me: everyone is welcome at FUMCR. We are called to treat everyone as the children of God they are. This is what it means to love God and love our neighbor as we love ourselves. I want to say a special word to our members who are LGBTQ+ or who have family members and friends who are part of that community. WE LOVE YOU, and GOD LOVES YOU. I am sorry for any pain you feel as a result of this decision. You are welcome at FUMCR. I also want to say a word to our members who have a more traditional view on this issue. As your pastor, I would be saying these same words to you that I shared above if the vote had gone the other way. Please be sensitive to your fellow church members who may be upset or hurting, just as I hope they would be if this vote had turned out differently. What does this mean for us at FUMCR? Our mission remains the same: with open hearts and minds, we welcome people for Christ, grow people in Christ, and serve people with Christ. I believe, by living out our mission day by day, this will not become a church-dividing issue for our congregation. We will continue to define ourselves as a “big tent” church where all are welcome. With Christ at the center, we will worship, study, and serve together. In an increasingly polarized society, I believe the church should be the place where we find unity in the midst of our disagreements. I look forward to seeing you on Sunday and sharing more with you. Thank you for being a church where everyone is welcome. If you were not able to attend an information session at FUMCR, this VIDEO was shown. It features Rev. Tom Berlin, Lead Pastor of Floris United Methodist Church, and member of the 32-person Commission on a Way Forward. Rev. Berlin provides a high-level overview of the dynamics present in the United Methodist Church as it relates to the questions of whether the church should offer marriage rites to homosexual couples and whether ordination should be available to self-avowed, practicing homosexual persons in this VIDEO. Florida Conference Bishop Ken Carter shares “7 Reasons” why he believes that The United Methodist Church will remain united in this VIDEO. Watch a parable from Gil Rendle that encourages humility in conversation in this VIDEO. Watch the Council of Bishops' One Church Model VIDEO. Watch the Commission on a Way Forward VIDEO. 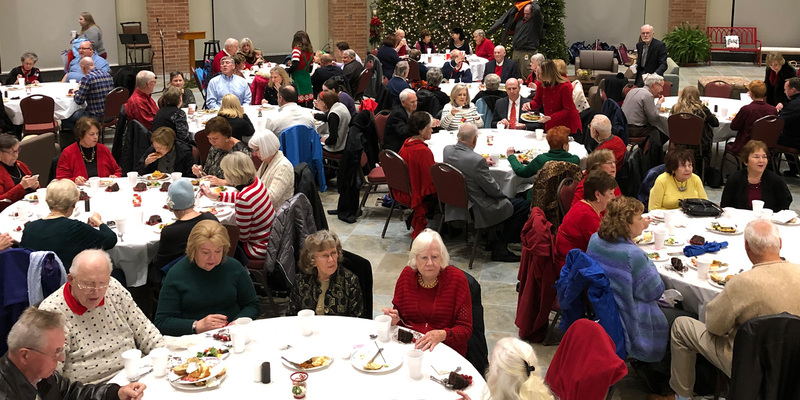 Throughout any given week at First United Methodist Church Richardson, you will see pews, seats and hallways filled with individuals whose stories differ. Their backgrounds differ. Their viewpoints differ. But, our faith brings us together each week to worship as a community, as we grow and serve side by side. We may not be the same, but we gather with a spirit of unity not uniformity. Our United Methodist denomination has been in ongoing conversations for over 40 years about human sexuality. The discussion centers around two specific areas, the marriage and the ordination of gay and lesbian persons. At the 2016 General Conference in Portland, Oregon, the Council of Bishops recommended the formation of the Commission on a Way Forward. The commission was comprised of 32 individuals from all corners of the world, with different backgrounds and perspectives. They met regularly for over 18 months as they formed recommendations for the future of the United Methodist Church as it relates to the ongoing conversations about human sexuality. - Create as much unity as possible. In February of 2019, a special session of the General Conference will convene to vote on one of three plans: the One Church Model (recommended by the commission), the Connectional Conference Plan, and the Traditional Plan. While the One Church Model will require compromise, I respect the commission’s recommendation and believe it’s the best decision for our denomination and FUMCR. In order to help our congregation better understand the plans being considered, I will host information sessions this fall. It is my hope that you have the factual information you need and that you stay informed throughout this process. Our mission remains. First United Methodist Church Richardson will continue to focus our attention and energy on our mission. In my opinion, some have allowed this conversation to rise to the level of being a church dividing issue, and I confidently do not believe it has to be. Our focus remains on welcoming people for Christ, growing people in Christ, and serving people with Christ. We are a Big Tent Church. That is to say, we do not all think alike, vote alike, or act alike. We come with our differences, but we find unity in the love of Jesus Christ. With Christ at the center, we can worship, study, and serve together. In an increasingly polarized society, I believe the church should be that place where we find our unity in spite of our disagreements. This is the place we learn to have faith-filled, reasonable discussions about our differences, and celebrate that we serve the same Lord. We have a future. FUMCR has been ministering to the souls of people since 1886. There have been many times of change and uncertainty, including depressions, world wars, social upheaval and unrest, and more. I am confident that FUMCR will continue caring for our community and our members for generations to come. Conflict will continue. Regardless of whether one of the plans passes or nothing passes, the discussions surrounding human sexuality are not going away. There will continue to be times where faithful Christians reading the same Bible will draw different conclusions. The only question is will we be a place where differences are explored with a Christ-like humility, compassion, and respect, treating every person as a child of God. We will continue to be who we are. Our church is known as a welcoming church. We will continue to welcome people and help people grow in their journey toward Jesus. I do not expect that any decision or non-decision will change the core fabric of our DNA as a church. We are here to bless our community by sharing the love of Jesus. I hope that you will be in prayer for our denomination and our church as we move forward into the future. Let me encourage you to attend one of our information sessions and find additional information on our website at fumcr.com/unity. Thank you for being the church you are. I am excited about where our church is positioned to move into a faith filled future. Let’s keep our eyes upon Jesus, and the commandment he gave us to Love God and Love our Neighbor.